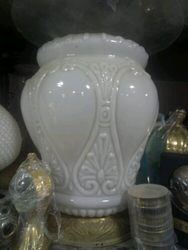 Fine Decorative Glass Lamp Available In Different Designs & Sizes. We use Stained Glass Lamps very effectively on Doors, Partitions, Lamp Shades, Table tops, Wall hangings, Coasters, Mirrors, Paper holders, tile designing & several other decorations. Our stained glass designs on frosted glass, textured glass, etched glass and ceramic art are the unequivocal choice for the interior designers, architects, builders and civil engineers. Our organization is involved in offering a distinctive array of bend Glass Window Design that has high aesthetic value. Offered in a variety of appealing designs, it is suitable for Residential Buildings, Corporate Offices, Shopping Malls and other places. With our rich experience and versatile knowledge, we can also offer customized designs as per client''s specifications. 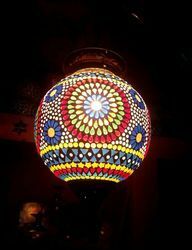 W e offer stained glass lamps for corner. These are ideal to be placed in corners of rooms, can be used in galleries of hotels, in lobbies. These add life to the corner. We are a prominent manufacturer, exporter and supplier of Stained Glass Lamps that are offered in vivid colour combinations and designs to suit the requirements of contemporary clients. These are widely appreciated for its excellent finish and precise dimensions. Available at industry leading prices, these excellent solutions can be customized as per the specifications of the client. Our stained glass lamps are stand-alone floor lamps that can be made in your colour and height preferences. These are unparalleled, beautiful lamps that sometimes have over 700-800 pieces of coloured glass joined together in lovely patterns.